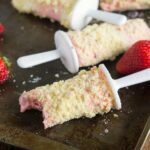 A strawberry shortcake popsicle made with fresh ingredients and coated in crumbled shortcake cookies – a Good Humor Popsicle inspired treat. These popsicles are simple to make and perfect to enjoy on a hot summer day. Strawberry shortcake has been a classic dessert in America for over 100 years. Crazy right? Well today I am bringing you a classic strawberry shortcake flavor in a very different form. I’m talking popsicles. 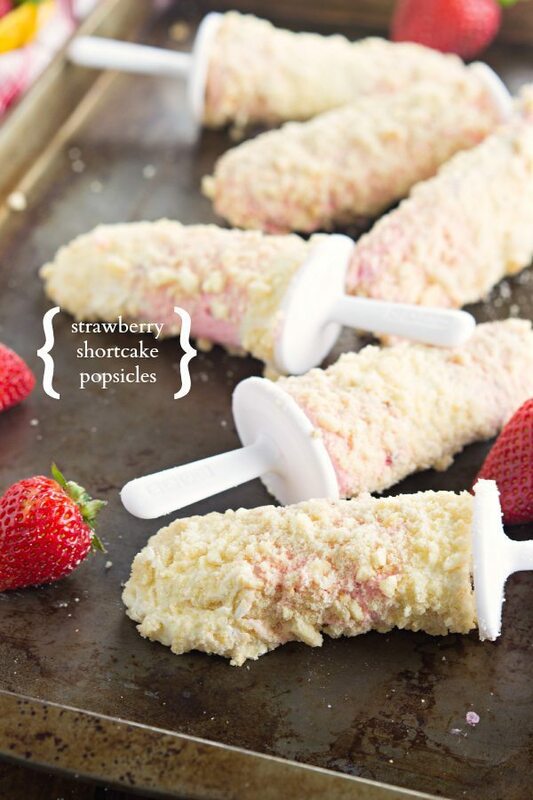 But these aren’t just regular popsicles – they are strawberry-filled, flavored, AND coated with crushed up shortcake cookies. This is a strawberry shortcake dessert at its finest. And I’m talking, the husband could not put these down. Good thing I made a couple of batches or I wouldn’t have even gotten to try these! These popsicles whip up quickly and they are super simple to make. And while the popsicles are getting all cold and frozen, you can make the shortcake cookies. Which, I might add – they are to. die. for. good. You start off by finely chopping up some strawberries super small. These strawberries get mixed with some fresh lemon juice and sugar. They sit while you prepare the rest of the mixture – cream cheese, sweetened condensed milk, and some whipped topping. Everything gets beaten and then stirred together. I wasn’t joking about how easy these are! To get the stripes and different colors in the popsicles, some of the white mixture gets removed. The removed portion gets the strawberries and strawberry jell-o mixed in to make the strawberry layers. The remaining mixture will be the “vanilla” part of the popsicle. Making the shortcake cookies are just as easy as these popsicles. Plus they only have 5 ingredients. Can’t beat that! Once the shortcake cookies are baked, they get crumbled into small crumbs. And the completely frozen popsicles get a generous coating of shortcake crumbs. And now you are ready to celebrate National Strawberry Shortcake Day! You are going to love these popiscles! Wash and remove the strawberry stems. Chop up the strawberries into very small pieces. Once the strawberries are finely chopped, they should measure to be 1 and 1/2 cups. If you have too many or too few, adjust but chopping a few strawberries (or eating a small handful!) In a medium sized bowl, toss the strawberries with the lemon juice and sugar. Allow to sit while preparing the "ice cream." In a large bowl, beat the cream cheese until smooth, about 3-4 minutes. Slowly add in the sweetened condensed milk while continuing to beat the ingredients together. Beat in the vanilla extract. Once the mixture is completely smooth and creamy, fold in the whipped topping using a spatula until completely combined. Remove two cups of the mixture into another bowl. Drain any liquid in the strawberry mixture and gently fold the chopped strawberries and strawberry jell-o mix into the removed two cups. Pour the strawberry mixture and the white mixture into popsicle molds alternating colors. Allow to freeze overnight or at least 10 hours. When the popsicles are almost done freezing, you can prepare the shortcake cookies. In a large bowl, beat together the butter and white sugar until just combined. Stir in the vanilla extract. In another bowl, combine the cornstarch, flour, and salt. Stir to combine. Combine the wet and dry ingredients. The mixture should appear crumbly. Knead the mixture together with your hands until a large ball of dough forms. On a floured surface, dump out the mixture and knead the dough into a large ball. Pinch off small pieces of the dough to form cookies. The cookies should be small (about a 1/4 inch thick) and pretty flat. Place the cookies on an ungreased baking sheet and sprinkle with sugar. Cook for 9-11 minutes or until lightly golden on the sides. Remove and transfer to a wire cooling rack to cool completely. Once the cookies are cooled, crumble them into small pieces and place on a large plate. 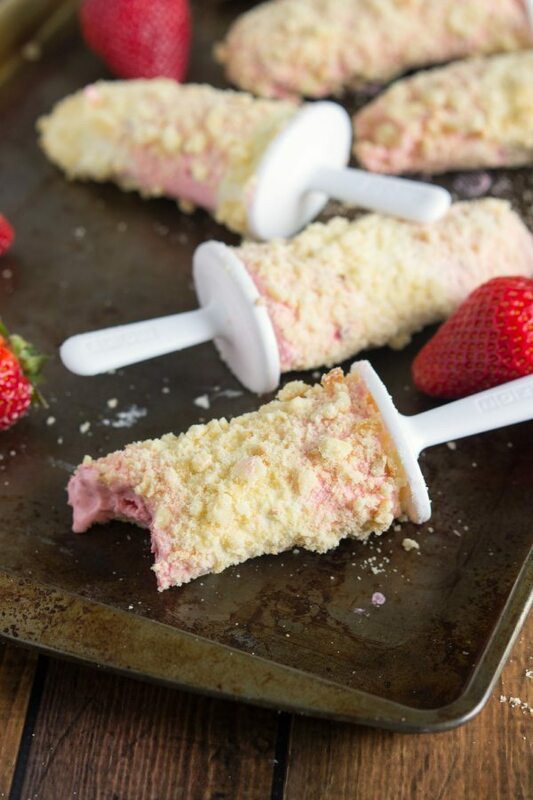 Roll the frozen popsicles (that have been thawed 2-3 minutes) onto the shortcake cookie crumbs. *If desired, you can substitute heavy whipping cream that has been whipped to form soft peaks and then measured to 3 cups. Amazing recipe, Chelsea! These remind me of the eclair good humor ice cream bars that I used to eat when I was younger! What a perfect recipe for the summer! Very fun Chelsea! Every strawberry shortcake is scrumptious in my book! When I was a kid, I was allergic to chocolate. When the Good Humor ice cream truck came around, and all the other kids were ordering chocolate this or that, I was delighting in GStrawberry Cheesecake Bars. With your recipe, now i can make them at home! A tiny bit of my childhood in every bite.Thanks, Chelea! Chelsea, these look fantastic! 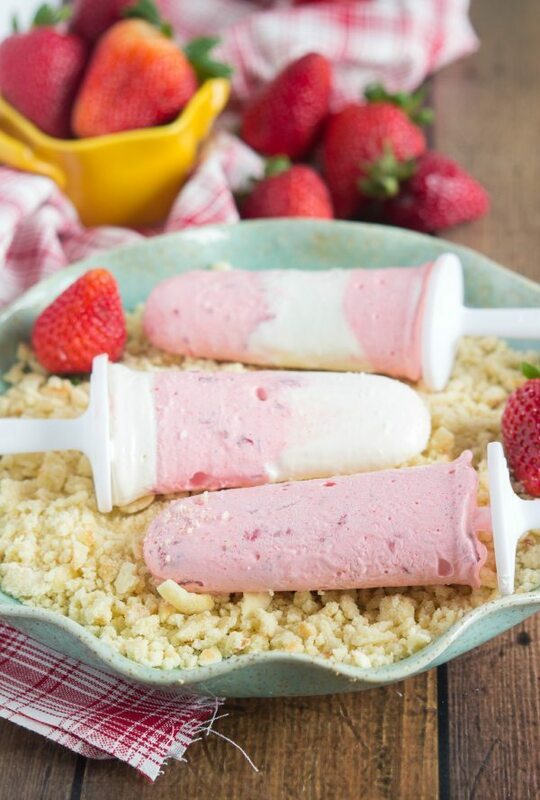 From the creamy strawberry popsicle to the shortbread crumbles… my family would love these! I just bought some popsicle molds and can’t wait to try these Strawberry Shortcake Ice Cream Bars!!! Wow, these look delicious! I love how you layered them and added cookie crumbs. Great idea 😀 I could eat these up! Pinning! Oh goodness, these bars remind me of the ice cream bars I would buy all the time as a kid. Now you have me feeling nostalgic! I know the homemade version will the best so I can’t wait to try yours! Loooooove these. Perfect for summer! i used to love those ice cream bars- especially the summer i worked at camp 🙂 delish! These are absolutely stunning Chelsea! We used to buy similar bars like this growing up but yours look 1000x better! Totally in love with these – pinning 🙂 Happy Friday and have a great weekend! I love that you posted these the same day I posted my strawberry shortcake twist! Love the idea of making this into a Popsicle and I’m so excited I can try this now that I just purchased a Popsicle maker! We have strawberry shortcake every week in the summer! This frozen twist is gorgeous and so creative. Pinned! Hope you are having a wonderful Friday! Chelsea…you did NOT…seriously? You made my very favorite-ist (yes, it’s a word) Good Humor treat in all the planet anywhere. I can hardly turn them down when I see them. They are seriously just that good. This is bad news for me. Very bad news. Pinning!!! I forgot how much I loved those Good Humor bars as a child. I love that you created a homemade version. Can’t wait to try these soon! What a fabulous idea! Love your twist on this classic, Chelsea! Pinned! My poor popsicle molds have been sitting in a cabinet for too long! I need to take them out and make these! Those strawberry shortcake ice cream popsicle things were my favorite when we were kids! These look so good! 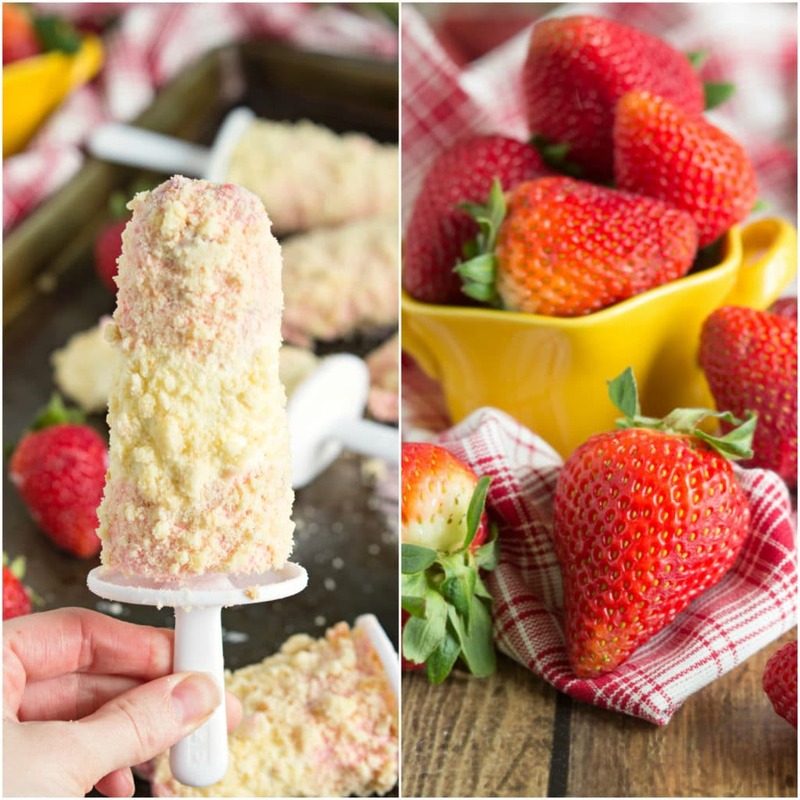 I love the Good Humor strawberry shortcake popsicles so I am sure I would love these even more! Delightful! I am dying over the crumbly bits covering these pops! I love it Chelsea! i love these. yours look even better! These look amazing! I’ve always wanted to try the Good Humor ones but for some reason never have. I’m gonna have to make these! These are definitely on my must make this summer list!! Pinned! WOW – these popsicles sound amazing – the combination and condensed milk, lemon and strawberries has me drooling! WOW!! Looks yummy! I would love it if you joined and contribute your awesome posts at my link party at City of Creative Dreams, starts on Fridays 😀 Hope to see you there at City of Creative Dreams Link Party. Omgoodness…. strawberry shortcake ice cream bars were seriously a childhood favorite of mine!! It was always my weakness! LOVE these!! This used to be one of my favorite summer treats from the ice cream man!! LOVE that you made it yourself. The outside is my favorite part! Also that you use cream cheese 😀 Pinned for later, thanks! These were one of my favorites as a kid! I LOVE your version! So pretty!! Oh my goodness! When I was a kid there were strawberry shortcake bars I used to make my mom buy every time she went to the grocery store. This looks like the homemade version of them! Whoa! THese look amazing! I had no idea June 14th is the national strawberry shortcake day. I’ve been wondering why there are so many strawberry shortcake recipes popping up lately ;). This sounds like the perfect way to celebrate! Would this work if you put the ice cream in a pan and just topped it with the shortcake cookie mixture? What an amazing summertime treat! What a fun summer snack! Love it! These look SO good! I used to love buying those bars off of an ice cream truck or at school, so I can’t wait to make my own! I was so excited when I saw this recipe. I love this ice cream! As others have said, it brings back childhood memories and I still buy them. Can you please figure out the Toasted Almond version? That’s another favorite of mine.